Although it’s known that Castel Rundegg was built around 1100, no written records exist to document who owned the castle or what events took place. In 1625, Grand Duke Leopold was granted the right to use the name “Rundegg” in his name. Another owner of the castle was a Baron Parovicini. Thrown out of the French army for dueling, he went on to live to the age of 104. He attributed his good health to daily two-hour walks. He also married four times and fathered ten children. By the 20th century, the castle was in a state of neglected ruin. Paul Sinn, a Tyrolean industrialist, bought the property and refurbished it as a luxury hotel. Merano has the reputation of being a retirement resort. Flocks of people with aches and pains come here for its Terme di Merano, or therapeutic baths. Don’t let that put you off though. The area has wonderful hiking trails (especially in the Parco Nazionale dello Stelvio) and castles galore. Castel Tirolo, Castello Principesco, and Castel Trauttmansdorff are some of the best ones to explore. Minimum stayis required during peak periods. Merano is easily reached by train via Bolzano. 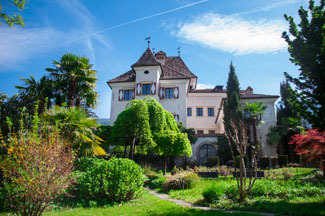 Within walking distance from the center of Merano, the castle is on the main road leading east and uphill. Not all castles have to be massive stone behemoths. Take for example Castel Rundegg: it looks more like a white frosted confection designed for a coming out party than a fortified bastion ready to fight off marauding invaders. The emphasis here is the spa and beauty farm. Massages, hydrobaths, and “haybaths” (hey, they might just work!) will soothe away the tension that any local Italian industrialist or road-weary traveler may feel. Decorators have taken advantage of the unique castle architecture with the guest rooms. Gothic vaulting, beamed ceilings, bay windows, and natural wood are highlighted against whitewashed walls. Oriental carpets complete the picture. The Tower Room is a special treat. Its beams date from the 12th century, and eight windows give a 360-degree view. Some guest rooms are located in structures (the “Farmhouse” and the “Remise”) apart from the main castle. They are interconnected by inside passages.